For the most part, Richmond is a classy city: Jeffersonian architecture, cobblestone streets, Sunday brunches, etc, etc. Even during the holidays, areas like historic Monument Avenue keep their Christmas decorations full of class- like this fancy little tree below. But I’d be lying if I told you that Monument Avenue Christmas decor was the norm around Richmond these days. This is actually the time of year where other parts of the city are happy to embrace their tacky side. Hence our beloved and famous (infamous?) Tacky Light Tour. I can’t claim to be an expert on the , but what I do know is that it’s basically a list of homes in the area boasting outrageous Christmas light displays. How outrageous? Well, to even be considered for the tour you’re required to have a MINIMUM of 40,000 lights. 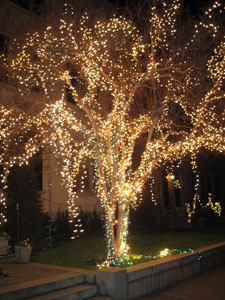 Most strands have maybe 50 lights? 100 lights? Either way, you do the math required to get to 40,000. For better or for worse, Richmond’s tacky side has drawn national attention, including a called “Crazy Christmas Lights” and this story on . One house, which we visited last night (see below), even topped USA Today’s list of . Somehow it even got listed before the Rockefeller tree in New York City. The tour is so popular around Richmond that every year droves of people rent buses and limos so they can tour in style. Or so they can tour with alcohol. Either way- drink up, shield your eyes and bask in the artificial glow. 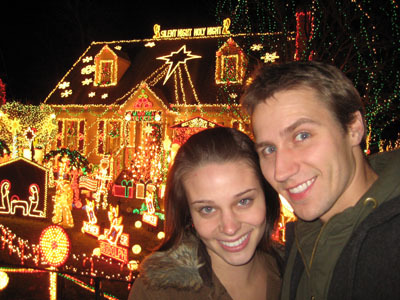 Wondering if you guys still part take in the tacky light tour?! Too fun! We hope to catch it this year! It’s so fun!